Learning a new culture through my children (with support from my swiss friends & Samichlaus!) - Time for a nice cup of tea? A while back Markus and Patrick kept mumbling a rhyme in swiss german when they were deciding who to go first. A dib dab sort of rhyme. I caught a few words like "chrumme bei" and "Chatz" and "walliselle" (district of zurich) but couldn't figure out at all what was going on. 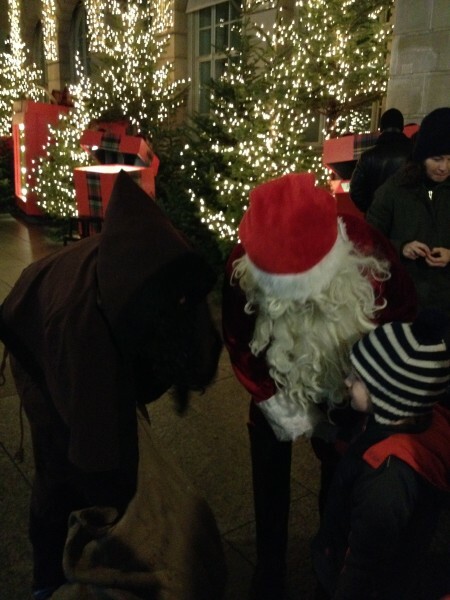 More recently last weekend we saw Samichlaus (santa claus) many times. The last time we saw him, he asked Markus his name and if he had a "Spruchli" for him, ie a learnt rhyme in Swiss German. Markus looked a bit bewildered, mumbled "nei", but got his bag of goodies anyway! Another friend at work, who's son his 6 months older than Markus, explained that there a collection of well known rhymes, all the kids know them, and they know that they have to learn them off by heart and then rattle them off when meeting Samichlaus! Who knew? This being Switzerland, my colleague was able to send me the link so I can prepare my boys for next year :-) They do expect the kids to learn long verses!